As consciousness on climate change grows, non-polluting and renewable sources of energy have been gaining a strong foothold. Hydroelectric power is one that has benefitted immensely from the desire of cleaner energy. Himachal itself plays host to magnificent and huge power projects and dams, which while generating energy without burning carbon, do have an adverse effect in terms of destroyed ecological systems and lands that come under their catchment area, while also requiring big monetary investments. The advances of technology have made generating power from water way simpler now, and tiny turbines with small outputs can be built over even small streams of flowing water. These small pico turbines can generate power to the tune of 5 kilowatt, with small monetary investment. Brahmnaad Power, a Shimla based company has its focus on smaller independent power projects that utilize these pico turbines, and the slightly larger micro turbines that are especially suited for the hill states of Himachal Pradesh, Uttrakhand and Jammu & Kashmir. A channel partner of Prakruti Renewable Power, Kanav Vaidya the Director of Brahmnaad Power believes that pico turbines can be installed anywhere, even in remote areas with very less water flow. Used for homes, the turbine could adequately meet the needs of a family. Pico turbines are fairly resilient to their operating conditions, and have been used even in forbidding terrains and circumstances. 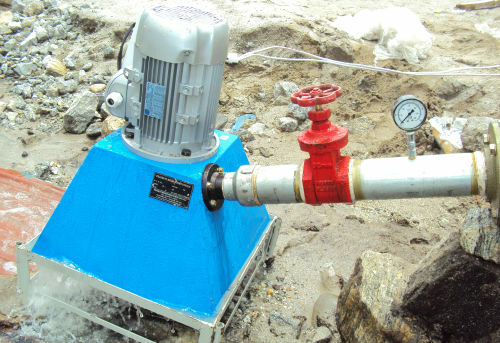 One such example was the use of a 1 kW pico turbine installed at Kedarnath, after the Himalayan tsunami, which is now providing electricity and resulting in improved relief works.